Photo at left by Steven Sabol. Photo on right taken at the 2007 convention by Rachel Speer. Note: New location this year for the Saturday session only! Potluck lunch: Local singers, please bring plenty of prepared food to share, as you are able. Saturday evening social nearby: location to be announced. All are welcome: beginners, experienced singers, and listeners. No admission charge -- free-will offering. Local singers, please bring a substantial meal to share each day that you plan to eat lunch at the convention. 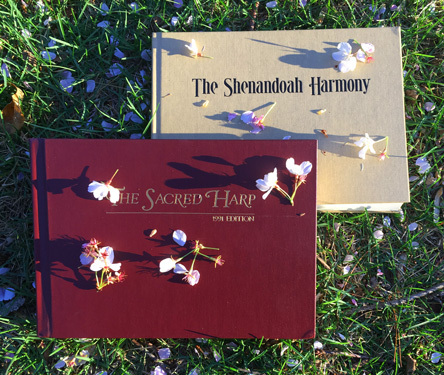 Copies of The Sacred Harp (1991 Edition, successor to the Denson Revision) and The Shenandoah Harmony (first published in 2013) will be available for loan and purchase. 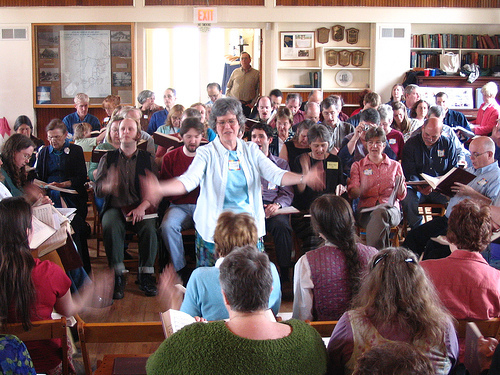 Singing at the Saturday session will be limited to The Sacred Harp, 1991 Edition, while singing at the Sunday session will be limited to The Shenandoah Harmony, in order to enhance the musical and emotional momentum. 2019 Convention Chair, Corinne Ducey; Vice-Chair, Leyland del Re. See Contacts link below. The Convention is announced on Facebook! This page has been accessed 720 times since January 18, 2019.